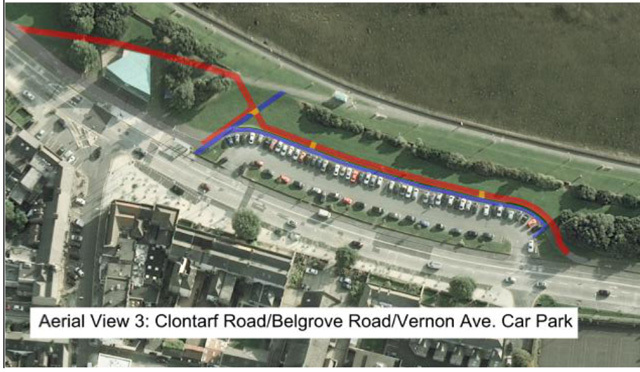 People cycling on a main cycle route along Dublin Bay in Clontarf could be told to yield to pedestrians and a car park entrance which cross the cycle path, if the recommendations of a report to city councillors is approved. Being told to yield to those crossing a main route is different to the norm where side roads and paths yield to the main flow of walking, cycling or motor traffic. The cycle path is one of the only sections of the Sutton to Sandycove cycle route along the city’s bay to be built. The new recommendations are part of a review of the Clontarf section of the route was undertaken to reduce conflicts between people walking and cycling. It was reported that it was originally suggested using Dutch cycle path speed ramps before it was found that these were for mopeds rather than bicycles. The report by the transport and environment section of Dublin City Council also recommends new paths to segregate walking and cycling, and closing one car park. The full report below via Cllr Naoise Ó Muirí (Fine Gael). While the attitude that it is cyclists who are endangering motorists who get out of their cars and step on to the cycle path without looking is annoying to me those changes are good. I’m against cyclists having to yield to people pulling out of car parks. Surely motorists should know that they are required to yield when exiting a car park and if they cannot see due to shrubbery then improving the sight lines by changing or removing the vegetation is a better solution. Adding yields for cyclists in situations like this promotes the notion that cyclists always need to yield to cars regardless of the circumstances. This Reports more like a script from Fr. Ted rather than a report from a publicly funded body. Like most of these type of documents it poses more questions than answers. Has the arrival of Mr Owen Keegan in DCC had any impact on the report? God knows he left a plethora of anti cycling constructions in DLRDCoCo. Were any cyclists consulted, even Sunday afternoon hobby cyclists? Maybe the consultation process was restricted to the shrubs! I always find myself in agreement with most of those that post messages. In this case I am very persuaded by HivemindX. How can we be so out of touch with what cyclists need when we are the cyclists? Unfortunately I have to agree with the above comments……This report reads like a major puzzle, with the priorities very skewed! 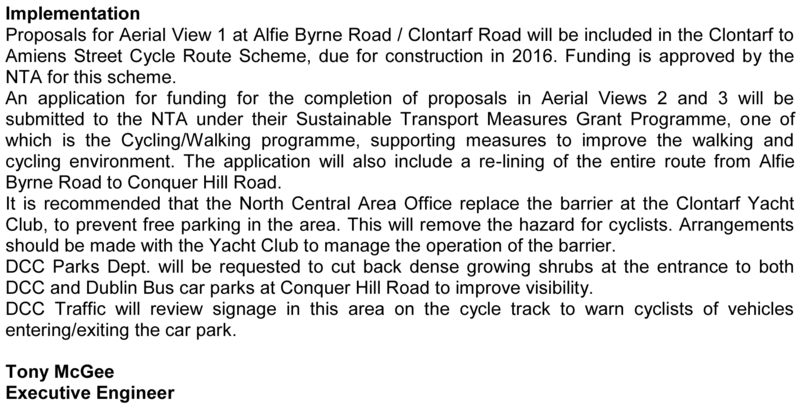 I cannot make head nor tail of the proposals, as outlined in the section at Alfie Byrne Road. I know that area reasonable well, and I would suggest that the proposals…as far as I can make them out!….are a case of overkill. The proposals at the other 2 public car parks need to be fully reviewed and the realistic view taken that motorists exiting their cars need to give way to the cyclists, not the other way round! This would follow ‘best practice’ in that pedestrians are crossing a main (cycling) thoroughfare. Beneath the dense convoluted language , there are some good ideas on improving the segregation between cyclists and others. Most are low cost such as the segment behind the ESB station/Vernon Avenue. It is surprising that it takes a report to note that “line marking has become faded…….causing confusion ” etc. The emphasis on cycling having to yield to pedestrians is depressing and reveals an inherent anti-cyclist mentality. Quite familiar with this route. I’m always happy to yield to pedestrians, that is as it should be. However the car park yielding suggestions are just insane. Good though that the path should be aligned away from the car parks, not for the sake of the drivers becoming pedestrians, but rather that the parked cars can encroach up to near a meter on the current path and are a hazard. What’s this really all about ? Mostly people getting out of cars in the car parks without looking where they are going when crossing the cycle track. People on bicycles having to yield to people walking on a non shared path ! Who ever heard the like of this ? Whoever came up with this must never have ridden a bike in their life. Momentum on a bicycle is important for the safety of the rider as well as everyone else. Having to stop and restart will more likely lead to some sort of accident, whereas if people walking actually took time to remember their safe cross code, all would be fine. What are we really looking at here ? The users of the least efficient form of urban transport once again throwing their toys out of their pram until they get their way. All this looks and sounds like a massive step backwards.